Gift Card Granny surveyed users to determine their gift card purchasing habits. 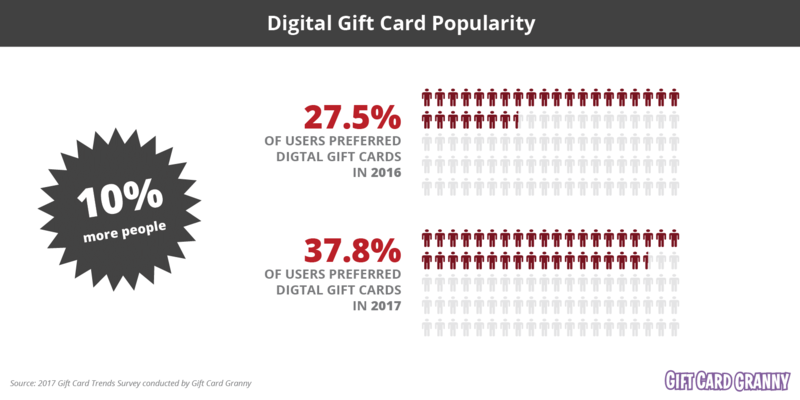 Data shows that there has been an increase in the use of digital gift cards. 86.9 percent of respondents have purchased either an eGift card or digital gift card. 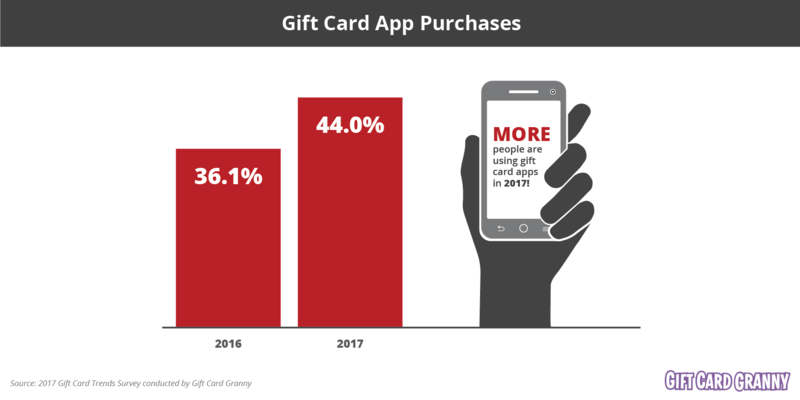 The popularity of electronic gift cards increased by 37.8 percent year over year. 44.0 percent of respondents have used an app to purchase a gift card. The digital gift card trend continues to grow. Purchasing habits of eGift cards have increased by 6.7 percent year over year. 86.9 percent of respondents have purchased a digital gift card compared to 81.4 percent in the previous year. People favor digital gift cards over plastic. 37.9 percent of people prefer electronic gift cards while 26.9 percent would rather have the physical card. 44.0 percent of survey respondents purchased a gift card by using a mobile app compared to the 36.1 percent in 2016. This resulted in a 22.0 percent change. Full survey PDF results that are compared to our 2016 survey can be found by clicking here. Q1. Have you ever purchased a gift card using a mobile app? Q3. Do you prefer physical or electronic gift cards? Q4. What are the top stores or restaurants you typically purchase gift cards for either as a gift or for yourself? Percentage are of users who placed these brands in there top 5 brands. Q5. What is the number one retailer you plan on shopping at online this holiday season? Percentage of users who placed retailer as their as their top brand to shop online at this holiday season. Q7. What is the typical value of each gift card you should purchase for people other than yourself? Q8. how many gift cards do you typically purchase for yourself each month? Q9. What is the typical value of each gift card you should purchase for yourself? Q11. How much time passes from when you purchase a gift card to redeeming it at the store or restaurant? Q12. How many gift cards do you currently own? Q13. What is the total value of these gift cards that you currently own? Q14. Have you ever used a coupon when making a purchase with a discount gift card? Q16. What do you do when you receive a gift card you don't like? Q17. Have you ever lost a gift card? Q18. How old are you? Q19. How often do you visit GiftCardGranny.com?